How to Cite This Chapter: Serrano P, Dąbrowski A, Jurkowska G, Wereszczyńska‑Siemiątkowska U. Pancreatic Cysts and Pseudocysts. McMaster Textbook of Internal Medicine. Kraków: Medycyna Praktyczna. https://empendium.com/mcmtextbook/chapter/B31.II.5.3 Accessed April 19, 2019. Banks PA, Bollen TL, Dervenis C, et al; Acute Pancreatitis Classification Working Group. Classification of acute pancreatitis–2012: revision of the Atlanta classification and definitions by international consensus. Gut. 2013 Jan;62(1):102-11. doi: 10.1136/gutjnl-2012-302779. Epub 2012 Oct 25. PubMed PMID: 23100216. Tanaka M, Fernández-del Castillo C, Adsay V, et al; International Association of Pancreatology. International consensus guidelines 2012 for the management of IPMN and MCN of the pancreas. Pancreatology. 2012 May-Jun;12(3):183-97. doi: 10.1016/j.pan.2012.04.004. Epub 2012 Apr 16. PubMed PMID: 22687371. Pancreatic cysts are fluid collections located within or outside the pancreas that usually contain pancreatic secretions. They may be classified as true cysts or postinflammatory cysts (pseudocysts). 1) Retention cysts, which result from dilation of the pancreatic duct due to obstruction (this is frequent in chronic pancreatitis). 2) Neoplastic cysts (these account for >50% of all pancreatic cysts): Mucinous cystic neoplasms (MCN) (may be malignant), serous cystadenoma (SCA) (almost always nonmalignant), intraductal papillary mucinous neoplasms (IPMN) (some are considered to be precancerous lesions). 3) Parasitic cysts, which develop as a result of echinococcosis, ascariasis, or schistosomiasis. 4) Dermoid (congenital) cysts and teratomas. 2. Postinflammatory cysts or pseudocysts are a complication of acute pancreatitis. This chapter will mainly focus on the diagnosis and management of pseudocysts. Patients with pseudocysts have a history of acute or chronic pancreatitis (or risk factors for these), or trauma. Signs and symptoms: abdominal discomfort, tenderness or acute pain; in some patients: nausea, vomiting, loss of appetite, progressive weight loss, fever. Patients may have palpable epigastric or abdominal mass. Presenting signs and symptoms may already result from complications (see Complications, below). Small cysts may be asymptomatic. Within 6 to 12 weeks of the onset of acute pancreatitis, up to 80% of postinflammatory fluid collections are spontaneously reabsorbed. However, the likelihood of reabsorption is lower in the case of multiple collections; large collections (≥4 cm); collections located in the pancreatic tail; thick-walled collections; collections communicating with the pancreatic duct; collections enlarging in the course of follow-up; collections with concomitant stenosis of the proximal pancreatic duct; collections caused by biliary or postsurgical acute pancreatitis or chronic pancreatitis due to alcohol abuse. 1. Laboratory tests: Elevated serum and urine alpha-amylase levels, elevated serum lipase levels; periodically elevated white blood cell (WBC) counts and serum C-reactive protein levels; elevated serum alkaline phosphatase (ALP) levels and hyperbilirubinemia in patients with compression of extrahepatic bile ducts. 2. Imaging studies: In patients with pseudocysts, results of ultrasonography and endoscopic ultrasonography (EUS) reveal an encapsulated fluid collection, usually with hyperechoic structures observed in the lumen. The presence of solid structures within the cyst lumen is not typical for a pseudocyst and should be further investigated to rule out malignancy. Computed tomography (CT) visualizes a smooth-walled, round, hypodense lesion with homogeneous low density typical of the fluid contents. Magnetic resonance cholangiopancreatography (MRCP) is the best method of documenting the communication of a cyst with the pancreatic duct. Endoscopic retrograde cholangiopancreatography (ERCP) should be performed in patients in whom endoscopic treatment is planned (eg, stenting of the pancreatic duct). Selective splanchnic angiography is performed in the case of suspected pseudoaneurysm, as it allows for embolization. 3. Examination of the cyst contents via EUS and fine-needle aspiration (FNA): If the diagnosis of pseudocysts is not confirmed by imaging studies or if an infection is suspected, the fluid cyst can be aspirated. The fluid of pseudocysts may be clear, watery, yellow, or brown; high alpha-amylase and lipase levels, markedly higher than the serum levels, are frequently seen. Microbiologic examination of the contents should be performed if infection is being considered. Patients with neoplastic cysts could have markedly elevated carcinoembryonic antigen and positive mucin staining. In these patients, cytology may help identify dysplastic or malignant cells. Differential diagnosis should be focused on differentiating the nonneoplastic and neoplastic cysts: Table 1. 1) Endoscopic internal drainage has similar efficacy to surgical drainage; however, it is less invasive and therefore it is the preferred first approach.Evidence 1Weak recommendation (benefits likely outweigh downsides, but the balance is close or uncertain; an alternative course of action may be better for some patients). Low Quality of Evidence (low confidence that we know true effects of the intervention). Quality of Evidence lowered due to poorly powered randomized trials without any meta-analysis. However, given the lower risk with endoscopic approaches with similar outcomes, it is reasonable to prefer endoscopic drainage procedures over surgical procedures. Varadarajulu S, Bang JY, Sutton BS, Trevino JM, Christein JD, Wilcox CM. Equal efficacy of endoscopic and surgical cystogastrostomy for pancreatic pseudocyst drainage in a randomized trial. Gastroenterology. 2013 Sep;145(3):583-90.e1. doi: 10.1053/j.gastro.2013.05.046. Epub 2013 May 31. PubMed PMID: 23732774. Varadarajulu S, Christein JD, Tamhane A, Drelichman ER, Wilcox CM. Prospective randomized trial comparing EUS and EGD for transmural drainage of pancreatic pseudocysts (with videos). Gastrointest Endosc. 2008 Dec;68(6):1102-11. doi: 10.1016/j.gie.2008.04.028. Epub 2008 Jul 21. PubMed PMID: 18640677. In patients with disrupted continuity of the pancreatic duct, endoscopic stenting might be performed with some success; otherwise, the stent may be introduced directly into the cyst via a gastric or duodenal approach. Before or during the drainage of persistent cysts communicating with the pancreatic duct, consider administration of octreotide 100 to 250 mg subcutaneously every 8 to 12 hours to reduce pancreatic secretion. 2) Image-guided external drainage could be performed if the endoscopic or surgical internal drainage is not feasible and the patient remains symptomatic due to the compression caused by the pseudocyst. 1) Complete resection of the cyst (this is often possible in cysts located in the pancreatic tail, in which case the cyst is resected with the pancreatic tail and the spleen is preserved if technically feasible). 2) Surgical internal drainage (ie, anastomosis of the cyst with the gastrointestinal tract: pancreatocystogastrostomy, pancreatocystoduodenostomy, or pancreatocystojejunostomy; complete cure rates are 70%-80%). 3) Surgical external drainage (the least favorable method, which often results in pancreatic cutaneous fistulae). 3. The persistence of large (≥4 cm) pseudocysts 12 weeks after the onset of acute pancreatitis is not an indication for therapeutic intervention if they remain asymptomatic; there is also no need for follow-up imaging.Evidence 2Weak recommendation (benefits likely outweigh downsides, but the balance is close or uncertain; an alternative course of action may be better for some patients). Low Quality of Evidence (low confidence that we know true effects of the intervention). Quality of Evidence on the management of large asymptomatic persistent pseudocysts lowered due to the lack of randomized trials or meta-analyses. Recommendation based on small prospective studies without comparison groups and clinical practice patterns. Cheruvu CV, Clarke MG, Prentice M, Eyre-Brook IA. Conservative treatment as an option in the management of pancreatic pseudocyst. Ann R Coll Surg Engl. 2003 Sep;85(5):313-6. 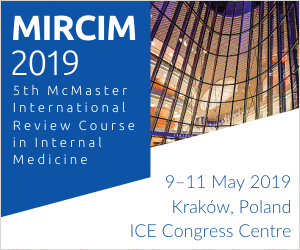 PubMed PMID: 14594534; PubMed Central PMCID: PMC1964324. Mehta R, Suvarna D, Sadasivan S, et al. Natural course of asymptomatic pancreatic pseudocyst: a prospective study. Indian J Gastroenterol. 2004 Jul-Aug;23(4):140-2. PubMed PMID: 15333970. In patients who are symptomatic, periodical measurements of biochemical parameters (serum and urine alpha-amylase levels, serum lipase, ALP, and bilirubin levels), WBC counts, and abdominal ultrasonography are warranted to evaluate the resolution of the pseudocyst. Differential diagnosis should always include neoplastic cysts. 1. Cyst rupture resulting in its drainage to the peritoneal cavity, which may lead to signs of peritonitis and ascites. Management is complex and may require a combination of percutaneous drainage and operative intervention. 2. Extrahepatic cholestasis or duodenal obstruction due to external duodenal compression by the cyst; in patients with cholestasis, perform MRCP and in some cases also ERCP with biliary stenting (when endoscopic treatment is indicated). 3. Bleeding from varices of the gastric fundus or esophagus, which form as a result of splenic or portal vein thrombosis or compression by the cyst. Doppler ultrasonography may be diagnostic. 4. Bleeding into the cyst lumen from the adjacent vessels, which manifests on ultrasonography as hyperechogenic contents of the cyst. 5. A pseudoaneurysm results from damage to peripancreatic arteries (splenic, gastroduodenal, pancreatoduodenal, and hepatic arteries) with persistent communication between the artery and the cyst lumen. Doppler ultrasonography may demonstrate blood flow within the cyst. The rupture of a pseudoaneurysm may cause bleeding to the peritoneal cavity or the retroperitoneal space, depending on the location. A rare complication of pseudoaneurysms is gastrointestinal bleeding via the pancreatic duct. Angioembolization is the preferred initial approach for bleeding pseudoaneurysms. CEA, carcinoembryonic antigen; IPMN, intraductal papillary mucinous neoplasms; MCN, mucinous cystic neoplasms; SCA, serous cystadenoma. Figure 1. 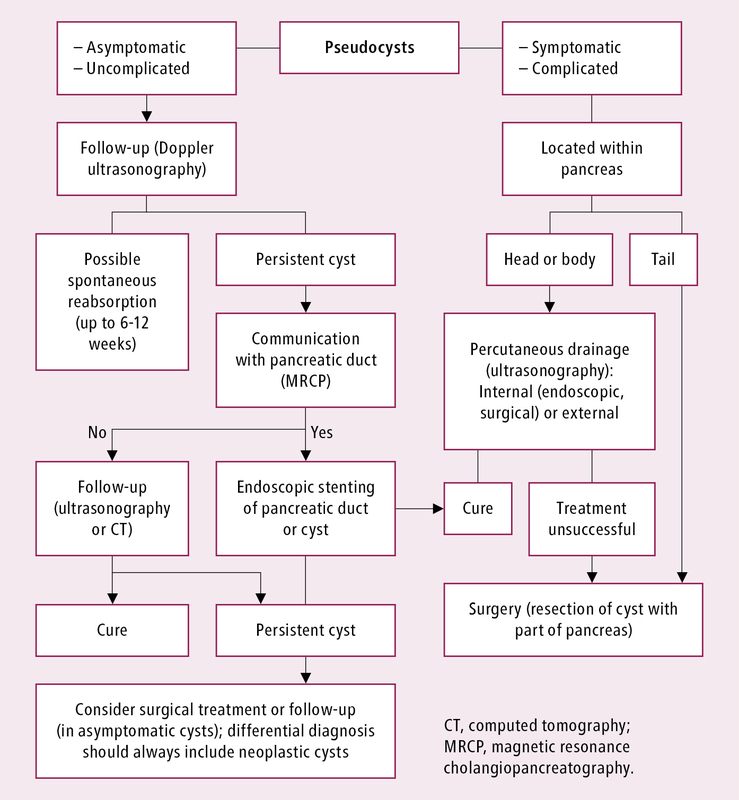 Treatment algorithm for pancreatic pseudocysts.